The Garden Detective: Dusty-looking Plant Leaves? Could Be Powdery Mildew. 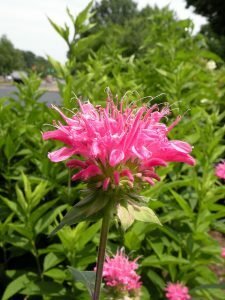 Q: I noticed that my bee balm and phlox looked bad this year. The leaves were covered with a white powdery substance. What is this stuff and is there anything I can do to control or prevent it next year? A: A fungus (from the genus Erysiphe) attacked your plants! 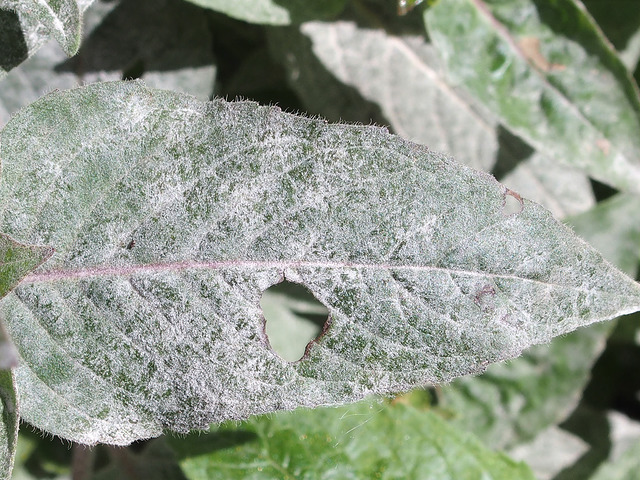 Many Erysiphe species produce powdery mildew—what looks like white dust on plant leaves, stems, and even flowers. There are other plant mildews that cause a white, powdery appearance—most notably downy mildew. For more information on the difference, see the blog Mildew on Plants? What to Watch for! Spider mite webbing is sign of insect problem, not disease. Also, serious infestations of tiny insect pests, such as spider mites, white flies, woolly aphids, or mealy bugs, may make your plants look white! If you look closely, you can see spider mite webbing, white flies flying, or aphid or mealy bug individuals to determine if you have an insect problem rather than a disease! What conditions favor powdery mildew? Powdery mildew’s preferred climate—hot dry days, cool nights, and morning fog—means that for gardeners in Western North Carolina, powdery mildew is a fact of life. 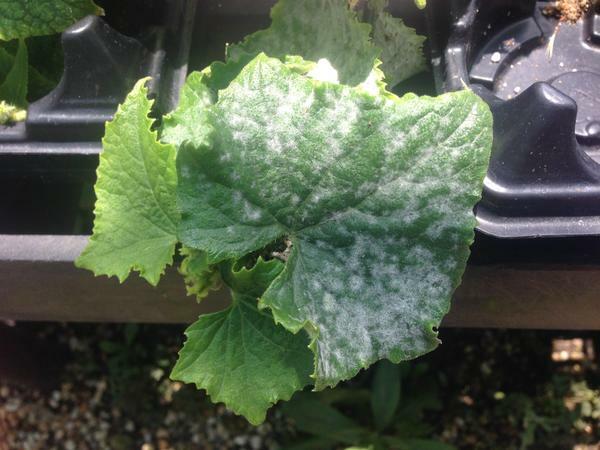 Powdery mildew requires living plant tissue for its vegetative part (the mycelium) to grow. Mats of branching mycelium threads absorb nutrients. As these mats spread, they decrease photosynthesis, causing affected leaves to look yellow (chlorotic). There isn’t much that powdery mildew doesn’t go after. It affects more than 1,300 plants! The good news is that it is host specific—different fungal strains affect different plants. 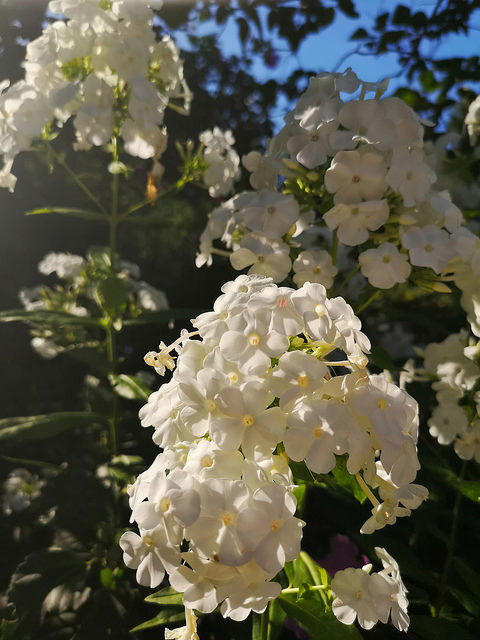 In addition to the perennials you mentioned, different fungal species cause problems for some ornamental trees, such as our beloved flowering dogwood (Cornus florida), vegetables—cucumbers in particular—and many fruits, including apples, strawberries, peaches, and grapes. Given the growing conditions in Western North Carolina, eliminating powdery mildew is a bit like Don Quixote tilting at windmills! Selecting disease resistant varieties is a better approach. Ask for disease resistant cultivars when shopping—or go with a list of desirable varieties. One good source is our own NCSU Mountain Horticultural and Crops Research Center in Fletcher, N.C. Testing done by Extension Specialist Dr. Richard Bir gives the following perennial cultivars high marks. NOTE: Resistance doesn’t mean immunity, but it does mean that there is a reduction of disease growth in the plant. Improve your growing conditions. Once you have selected the right variety, give your plants the best chance for success. Grow them in full sun—if your plants can tolerate it. Powdery mildew prefers shade! Give them breathing room. Encourage good air circulation by thinning and pruning. Reduce or eliminate overhead watering. Remove and dispose of infected leaves during the growing season. In the fall, remove and destroy infected leaves and branches. Apply fungicides that target powdery mildew, remembering that most need to be applied before the onset of infection. Use horticultural oil—but only if conditions are right. Some oils may cause damage if applied during warmer summer weather. Yes, powdery mildew is a formidable opponent. But by selecting the right plants and creating an environment that impedes fungal growth, you and your garden can enjoy success next season! Mildew on Plants? What to Watch for! In addition to the mildew that may appear in your house in damp, dark places, you may soon see mildew on your outdoor plants! Both downy and powdery mildews are likely to infest Western North Carolina gardens this summer. Should you be concerned? Is there anything you can do to stop them? 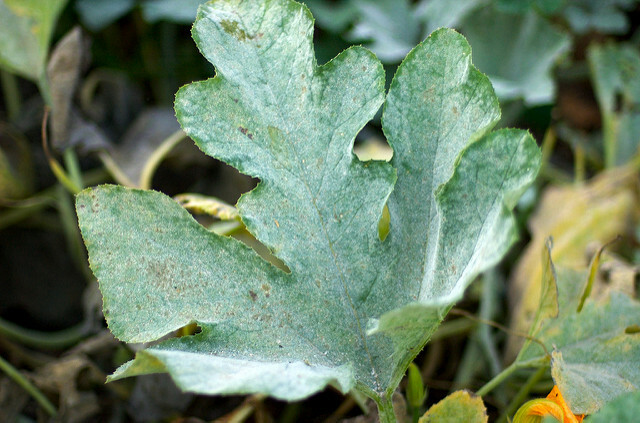 If you see spots on leaves, you may have plant mildew. 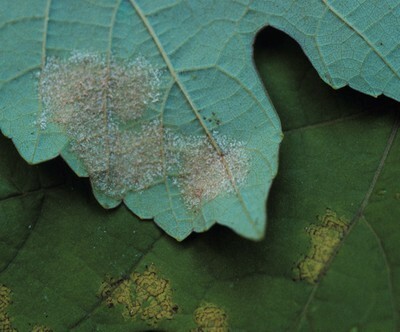 The spots may appear on the top surface of the leaf, the underside, or both. Powdery mildews tend to start out looking like white powder on the top of leaves, while downy mildews often first appear on the underside of leaves as downy-looking spores that range from white to quite dark, depending on the plant. As the disease progresses, downy mildews may produce yellow lesions on top of leaves that are defined by leaf veins. Mildews may also appear on other plant parts, such as flowers. Although mildews affect many plants, the good news is that most mildews on shrubs, trees, and perennials are unsightly, but not fatal to the plant. The bad news is that mildews are much more serious on annuals and cucurbit vegetables, which include cucumbers, squash, pumpkins, gourds, and melons. 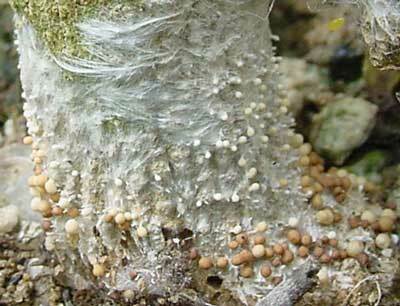 Many different strains of fungi cause powdery mildews, but downy mildews are caused by different fungus-like organisms. Although you may find both types of mildews on susceptible plants, the strains that cause mildews on one type of plant will not spread to other types. So, no need to worry that powdery mildew on your dogwood tree will spread to your cucumbers! When you buy plants, you may find selections bred for resistance to mildews, or to better tolerate these diseases. If mildew-resistant varieties aren’t available, carefully examine the plants you buy for signs of infection. If you’ve had problems with mildews in the past, be sure you’ve removed any diseased plants or weeds that may serve as a refuge for the pathogens. 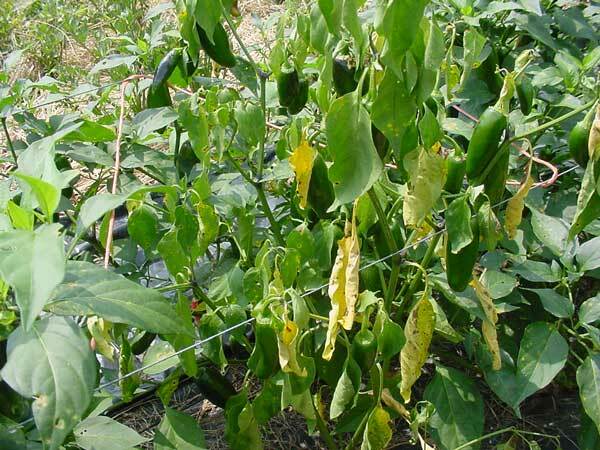 Do not save seed from downy mildew-infected plants as they may produce diseased plants. Give your plants plenty of space for air circulation and avoid overhead watering. Cool-to-moderate humid weather promotes the growth of mildews, so that’s when you’re first likely to spot problems. Although fungicides are available to help prevent mildews, for home gardens preventive spraying requires vigilance and may not be worth the effort. Instead, remove diseased plants from your garden before the disease spreads. – Clemson Cooperative Extension: Charts of plants resistant to powdery mildew and examples of fungicide products. – Perdue Extension: List of disease-resistant annuals and perennials. – NC State Extension: Curcurbit powdery mildew. With summer coming, so are plant diseases. One that can affect an astonishing variety of plants—from apple trees to zinnias—is Southern blight, caused by the fungus Sclerotium rolfsii. 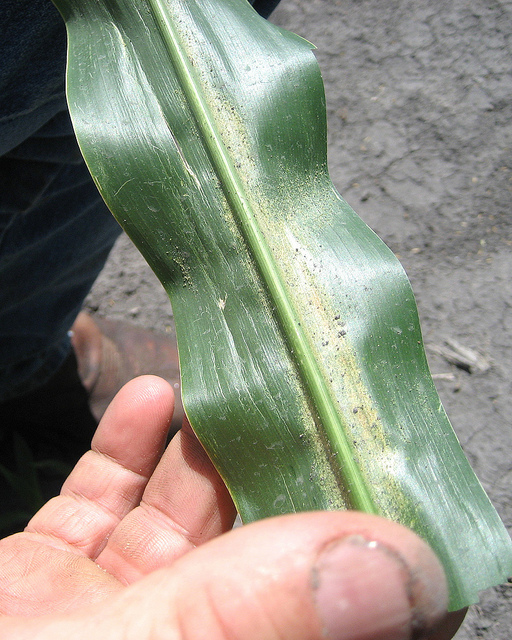 Southern blight thrives in hot, humid conditions. Although the fungus can infect many plant parts—including roots and fruits—it typically shows itself as wilt resulting from rotting stems at the base of the plant. Even before the plant wilts, you’ll often see water-soaked spots on the stems. Some plants are particularly vulnerable. Hostas may succumb in your perennial garden. Many root crops are affected, including beets, carrots, Jerusalem artichokes, parsnips, radishes, sweet potatoes, and turnips. Other victims may be cantaloupe, eggplant, peppers, snap beans, sweet corn, and tomatoes. One reason Southern blight can persist in soils is that it forms sclerotia: hard, rounded bodies that look like mustard or radish seeds. The disease is sometimes called Sclerotial blight for this reason. It can also remain in plant residue in the soil and spread through surface water. As with all fungal diseases, prevention is key. Once the plants are infected, fungicides may help prevent the spread of the disease to other plants, but won’t reverse problems on plants already affected. Depending on the crop, fungicides used as soil drenches prior to planting may prevent infection. Different fungicides are recommended for different crops, however. 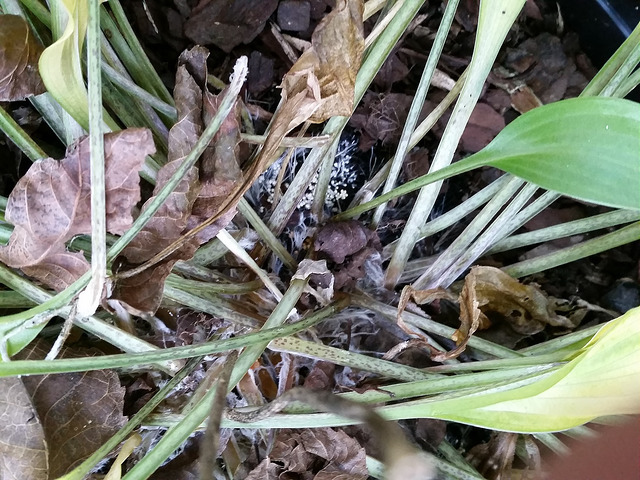 Immediately remove infected plants along with their roots and the surrounding soil. Do not compost! If container plants are affected, do not reuse the potting soil. If Southern blight takes hold in your garden, solarizing for several weeks using plastic during the summer may kill the fungus.